Wood pellet stoves are a home heating appliance specifically designed to burn small pellets made from saw dust. As we search for renewable sources of energy these stoves have become popular as they burn what is referred to as biomass, or more simply a biological product that can be re-grown. The fact that they most commonly burn a by-product of lumber production is also a plus. Wood pellet stoves can be free standing and decorative with similar styling to a more traditional wood stove as seen in the video above. They are also available as a fire place insert and can even be a home’s central heating system as a wood pellet furnace. Are there pollution concerns with wood pellet stoves? What do wood pellet stoves cost? Most pellet stoves cost between $1,200 and $3,000. 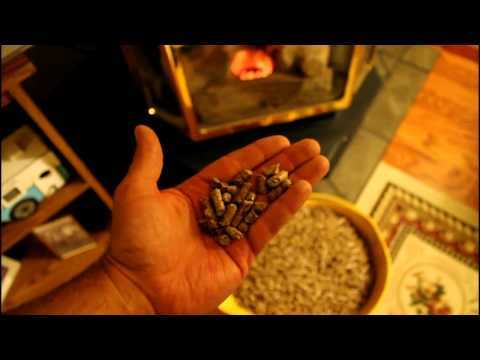 How much heat can wood pellet stoves produce? Pellet stoves have heating capacities that range between 8,000 and 90,000 Btu’s per hour. How much do pellets cost? Pellets are typically sold in 40 pound bags. The price will be dependent upon their availability in your location and the volume which you purchase. In October of 2010, at a Home Depot in Pittsburgh, the price for one ton of pellets in 40 pound bags was $182 or $3.64/bag which is a pretty good price. You could pay as much as $6/bag or $300/ton depending on their availability in your area. What holds a pellet together? Pellets contain no glue. They are saw dust that is bonded together by pressure and heat as they are extruded. Lingin, a natural chemical in the wood acts as the bonding agent when heated. Can wood pellet stoves burn other materials? Some models can also burn nutshells, corn kernels, sun flower seeds, cherry pits and wheat. Scrape paper can also be used to produce pellets.